Blurb: When you try to set your mom’s life right, be prepared to have your own turned upside down. Seventeen-year-old Ila Islam has serious problems. There’s the angst of being an Ali Zafar groupie, for one. Then there are the extra layers of fat she owes to her Punjabi roots. Add to this, parents who have separated; an enthusiastic best friend whose idea of variety is dating three guys at the same time; and her mom’s best friend, Aunty Maleeka, whose good intentions and savvy ways throw up more problems than solutions – and Ila’s got her hands quite full. When her mother flips out over her plans to stalk Ali Zafar, Ila decides she has had enough and sets out to create a few distractions to keep her mom busy. With a little help from BFF Deepali, Aunty Maleeka and Dev of the inviting chocolate pool eyes, Ila will have to brave everything from Lagan.com and OKCupid profiles to meeting handlebar-moustache colonels and middle-ages psychos, as she tries to set up the perfect parent trap for her unsuspecting mother. 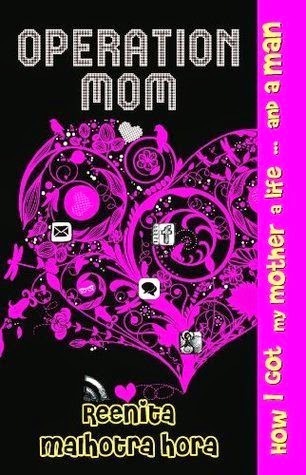 Verdict: ‘Operation Mom’ is the third book by the author Reenita Malhotra Hora. The tag line of the book perfectly indicates that this book is going to be one fresh read. The first thing that escaped my mouth after holding the book is gorgeous. Call it the color combination or the delightful design the cover looks affluent. The name seems perfect to me and the tag line, as I said earlier gives a hint of the story. After reading the blurb one can easily say that this book is going to be different and hilariously interesting. I can’t skip to mention the attendance of the famous application icons in the cover will definitely attract its user and mark it as a trendy book. The characterizations are real, not literally but one can easily feel that those are not fictional but exists around us. From the names to the way they converse and the way the author has presented her characters, they will feel real to the readers. No unnecessary characters to confuse the readers neither any boring character which can affect the flow of the story. In short this author has used her experience in writing efficiently in creating jolly and feel-real characters. The narrating style is trendy and entertaining. No reader can feel bored in any part of the story. From the very beginning the author is able to catch the perfect atmosphere for the book that will definitely help to hook the readers. At times I felt the narrating style a bit girlish, or a girl will find the narrating style more likable than a boy because the author has described about how a girl thinks in situations or reacts is situations. But I enjoyed the book thoroughly and laughed at the sense of humor of the author many times. The story line is different and fresh. Being in the genre of young adult this book will surely entertain the young more. The story revolves around a girl named Ila who tries to add a bit masala in her mother’s life with the help of a friend and that is how starts the Operation Mom. In this quest they finds some information which will shock them to the core and will turn Ila’s life upside down. The story line is uncommon but could have been framed in a more interesting way. The story ends in a happy note and will definitely bring a lasting smile on the readers face. The narrating style is so strong that the readers are bound to ignore the flaws of the book. The author’s efficient sense of humor will entertain the readers till the end. If the narrating style has something more for the boys and if the twist in the end was a bit different I would call this book perfect. Final Words: The mature narrating style, the hilarious conversations, the perky characters and the enjoyable story line will entertain the youth till the end. A must read for the young.